I am on Week 3 of having out-of-town houseguests. It’s been great to see loved ones, but I’m over it. First it was my sister-in-law, then it was my sister’s family, and on Sunday my in-laws arrived for a week. They drove across the country and are sleeping in their RV in front of my house. It’s a little weird. They have their own toilet in there and I can wave to them from my kitchen window. I can’t actually see into the toilet area – I believe it’s called a ‘bathroom’ – but once you realize they can poop in your driveway it starts to feel like an RV is just one giant porta potty. Then again, they have cable TV in the RV and I don’t have it in my house, so who’s the savage now? Unfortunately for my in-laws, being the last in our long line of houseguests means they are getting the leftovers. The scraps. I am tired, and fresh out of ideas for how to entertain other people. Yesterday the agenda was: Napping. Every single person attempted a nap at some point. I also gave them some cheese and crackers, so that was pretty awesome of me. I failed to consider how exhausting it would be to schedule all of our summer visitors back-to-back. Thank goodness for the greatest form of free entertainment ever created. Say it with me, kids: A Trash Walk . That’s right – we have taken each one of our visitors around our neighborhood to pick up garbage. Martha Stewart would be horrified by my hostessing skills. But you know what? They all liked it. From ages 2-70, every person found enjoyment in grabbing trash. My nephews were delighted by the number of socks we found (5!). 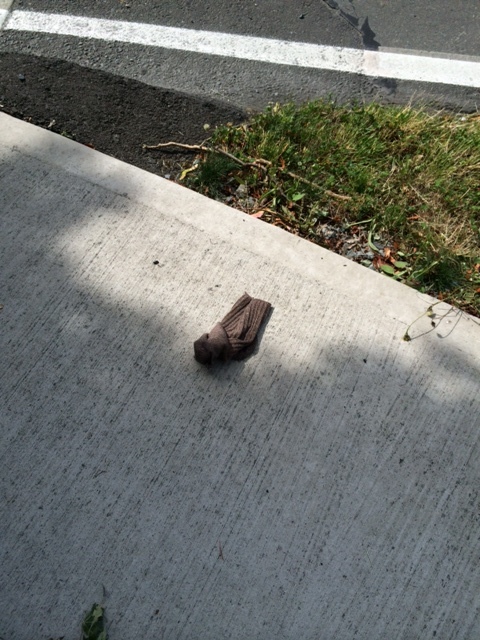 Let me know if this brown sock is yours. It’s always fun and disturbing to guess the origin of odd pieces of trash. Who loses one sock? What type of murderer dropped a single surgical glove in a parking lot? Don’t even get me started on the jewels you can find near a 7-11. Let’s just say there are a disproportionately high number of Big Bite hot dog wrappers in nearby bushes. Either Big Bite customers are more likely to litter, or they have terrible aim when trying to hit a trash can. Someone should do a study on this. I don’t know what I’m going to do with my in-laws for the next four days. Maybe clean out the garage? Or ask them to help fix my garbage disposal? Those are real ideas that my husband and I have discussed. But once I see them typed out I realize how horrible they are, so I’ll try harder. Maybe we’ll get started on that Big Bite study. Ok, well, I love the idea of a trash walk with guests. We have my in laws coming for 2 weeks and since they drive me bananas this sounds awesome. I think I’ll find the boys those snapping dinosaur things so they can grab the trash. And yeah- wtf dude. Socks? The is indeed a mystery. A ‘WC in an RV’ definitely has a ring to it. And probably a stink. Ahahaha I need to get out more. When my in laws come they rarely want to do anything we suggest so we just spend a lot of time staring at each other. Maybe I should suggest a trash walk next time to see if they are game. 3 weeks of guests. I’d be running away from home by now. I think you deserve an award or maybe a giant, chocolate cake. Staring at each other is always a fun way to entertain guests. I think I read that in Martha Stewart. Napping is ALWAYS a good choice. Did I tell you I am bringing my family next week? You would be MORE than welcome at the hotel. I may not be here, but my children will be. They require 16 feedings per day and they don’t sleep much. Enjoy! Napping should be on every agenda. And I am missing a brown sock. Hmmm…. No one should be left without their brown socks during sandal season. I’ll put it in the mail asap. It has taken every ounce of willpower not to yell “The shitter’s full!” at least once this week. Yesterday’s agenda: napping. Totally my favorite. And I might institute a trash walk around our house. Full disclosure, I am a horrible hostess. I don’t think of the pesky little details, like having appropriate pieces of bedding for everyone or keeping the bathroom stocked with toilet paper. They’re lucky if I’ve vacuumed. People should come with their own toilet paper. That’s just common logic.